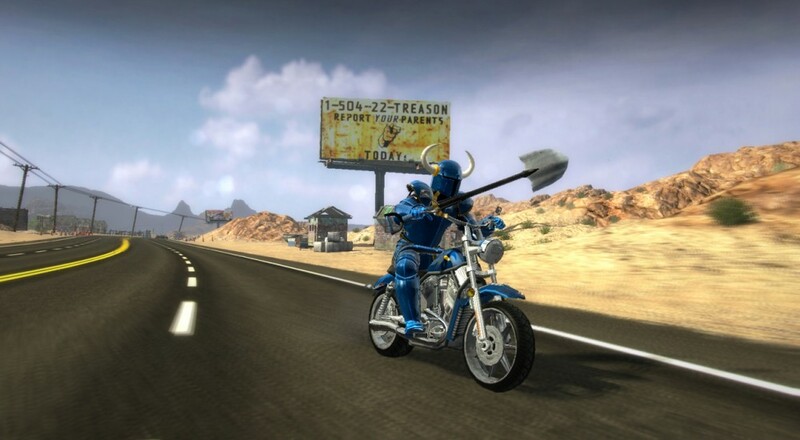 While you've been able to enjoy playing with friends in Darkseas' Road Redemption, a spiritual successor to Road Rash, for some time now, you can now finally enjoy some co-op throughout the entire campaign in four player splitscreen. That's right, you and your buddies can hop on your bikes and take to the road. Granted, huddling around a computer screen isn't exactly the ideal way to couch co-op something, but as senior programmer Stephen Glindmeyer points out, our modern 1080p screens are way better than those CRT TVs of the past. "When you get a bunch of friends together, it’s nice to be able to play a modern game without having to buy 4 copies and 4 gaming PC’s. With modern 1080p monitors, each quadrant of a 4 player splitscreen actually has 7x as many pixels as the entire screen in Mario Kart 64 or Goldeneye!" At the moment, the co-op is local only but they're running a closed beta of online multiplayer/co-op, for those that may prefer to cooperate with their friends from afar. No release date has been announced/set just yet. It was originally set for Q1 2017, but that date has obviously been pushed back. It will come out for PC, Mac, Linux, PlayStation 4, and Xbox One when it does get a full release, but you can check it out on Steam Early Access now. Page created in 1.0104 seconds.